The #1 Portuguese Brazilian English Dictionary for Android Phones and Tablets. Advanced features and extensive content make VidaLingua the most comprehensive Portuguese Brazilian English Dictionary for Android Phones and Tablets. Thanks Amazed. thought Portuguese was extremely hard to learn.. but this app proves me wrong. " Very useful application Includes dictionaries for both languages, pronunciations, phrases! Thanks! " Perfect! Great interface easy to navigate and use. No need for Internet for the words are written to the device. Super recommend. " 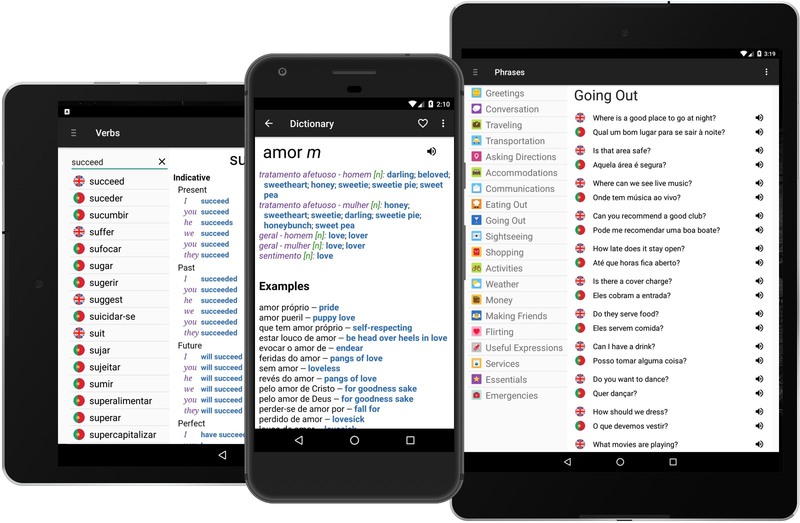 This app has everything you'll ever need if you want to learn Portuguese. " Best Portuguese English Dictionary. Works offline so you don't get hit with roaming charges. " Portuguese Brazilian English Dictionary with over 667.000 offline entries. Includes translations, usage examples, parts-of-speech & noun genders. Compiled & updated by professional linguists. Twenty categories such as Conversation, Asking Directions, Eating Out, Flirting and Making Friends. Search on key word. Hear phrases pronounced in Portuguese Brazilian or English. Conjugations of 6.419 Portuguese & English verbs. in all major moods (Indicative, Subjunctive, Conditional) and tenses (Present, Past, Future, Perfect, Pluperfect, Future Perfect). Text-to-speech pronunciation of all dictionary entries, translations, usage examples, phrases and verbs. Offline and higher quality online voices in Settings. Translate complete sentences from one language to another (requires internet). Hear translations pronounced in Portuguese Brazilian and English. Language is living! Only VidaLingua allows you to add words, notes and images to the dictionary. Portuguese English Dictionary + is an engaging travel companion, enriched by your learning experiences. "Bilingual dictionary apps from VidaLingua are hugely popular... they're free and they work offline, handy when you're actually abroad." "Most comprehensive dictionary app... a must have on our beloved 'droids. Far more than a dictionary. There are examples of everyday sentences, verb conjugation and a simple yet fun quiz to practice vocabulary in your spare time." Peter Warrior, reviewing Spanish English version. "Simples, prático e muito flexível. Assim, é possível dizer que todas as ferramentas disponíveis são de uso fácil e não devem trazer maiores dificuldades na operação, mesmo para iniciantes. De uma maneira geral, a interface do programa também é muito elegante e limpa, algo que deixa o seu uso extremamente agradável." Download it now from the Google Play and start learning today!